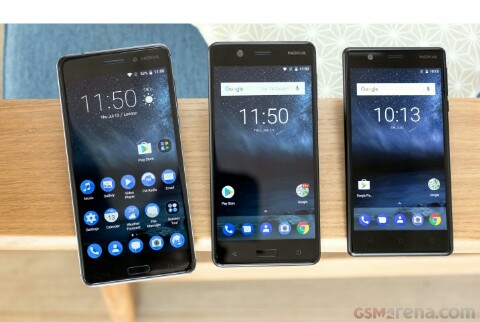 You see, the Nokia 5 has the 3's display resolution on a slightly larger diagonal, but not as large as the 6. An aluminum unibody, not unlike the 6's, has been chosen instead of the 3's aluminum frame/plastic back combo, and while the entry-level 3 didn't get a fingerprint reader, there is one gracing the 5's face. Inside the Nokia 5 you'll find the 6's more powerful chipset, but the 3's scant 2GB of RAM and 16GB of storage. The 5 matches the 6's battery capacity at 3,000mAh, but is denied the stereo speakers and it's a single bottom-firing unit this time - like the one on the Nokia 3. But even those that insist on rounding to even have to agree that the 13MP rear camera makes a solid case for the Nokia 5 being a 5 and not a 4 - an 8MP camera on the Nokia 3, 16MP on the Nokia 6, and 13MP makes for a Nokia 4.875, so 5 then, alright, we concede. The point we're trying to make with this math gibberish is that the new Nokia is doing a good job of segmenting its products, and is offering something to cater to varied target audiences. Maybe a Nokia 4 would be too much - let's not go there. Body: Aluminum body, 2.5D Gorilla Glass display glass (unspecified version). Tempered Blue, Silver, Matte Black, Copper color schemes.Display: 5.2" IPS LCD 1,280x720px resolution, 282ppi.Rear camera: 13MP, 1.12µm pixel size, f/2.0 aperture, phase detection autofocus, dual LED, dual tone flash; 1080p/30fps video recording.Front camera: 8MP 1.12µm pixel size, f/2.0 aperture, autofocus; 1080p/30fps video recording.OS/Software: Android 7.1.1 Nougat.Chipsets: Qualcomm Snapdragon 430: octa-core 1.4GHz Cortex-A53 CPU, Adreno 505 GPU.Memory: 2GB of RAM; 16GB of storage, dedicated microSD slot for expansion.Battery: 3,000mAh Li-Po (sealed).Connectivity: Dual SIM version available (ours is single SIM); Cat.4 LTE (150/50Mbps); microUSB 2.0; Wi-Fi a/b/g/n; GPS; Bluetooth 4.1; FM Radio; NFC.Misc: Front-mounted fingerprint reader; single speaker on the bottom; 3.5mm jack. We have to praise Nokia for opting for a dedicated microSD slot that lets you have a memory card and two SIM cards in the phone at the same time - that is, if you get the dual SIM version of the Nokia 5, which our review unit isn't. But a microSD slot doesn't really make up for the 16GB of storage - we'd have been happier with 32GB. Less of an issue, but still worth whining about is Nokia decision to go with a microUSB 2.0 port instead of the USB-C of the present and future. Sure, you probably still have a bunch of those microUSB cables lying around, but we do have to move forward eventually, right? Major phone makers should spearhead the change or we'll be left with two competing standards for quite a while.